Baby teeth come and go, causing many adults and their children to pay little attention to proper pediatric oral health. However, whether your little one is just about to start teething, or they are already well on their way to developing an electrifying smile, it’s important to find the best dental care to ensure they are equipped with the best oral care. Not only will quality oral hygiene benefit your little one’s health, but it can also do wonders for their self-esteem. If you’re on this page because you are in need of a pediatric dentist in San Marcos, Seguin, or the surrounding areas, then Alligator Dental is here to put a big smile on your face! Our children’s dental care team is here to provide a fun and welcoming environment for kids of all ages. We go to great lengths to ensure children have a memorable time at their dental visits, providing movies, arcade games, and more. The only thing we care about more than fun is proper oral health. If you have been curious about baby teeth, be sure to learn more in this blog post, and feel free to contact our pediatric dentists to schedule your child’s appointment! When do baby teeth begin to show up? Your child’s first tooth will probably emerge around six months, but keep in mind that the age can vary from birth to one year of age. You will likely see the first eruption in the center of the lower jaw, followed by a second central incisor on the bottom. After this, the upper incisors tend to come in next, with future teeth coming in around the center first and moving outward. Keep track of your child’s tooth growth, as they will likely lose their baby teeth in the same order that they came in. Your child will begin to lose their first tooth around the age of six, with the last molar falling out around 11 or 12. While losing a tooth is often painless, bear in mind that tooth growth can be extremely uncomfortable for toddlers and infants. If you’re dealing with an unhappy child due to their teething, be sure to contact us for complete assistance! Are baby teeth the same as adult teeth? Your child’s primary teeth will be nearly identical to your adult teeth in structure, with a few small differences in terms of makeup and layer density. 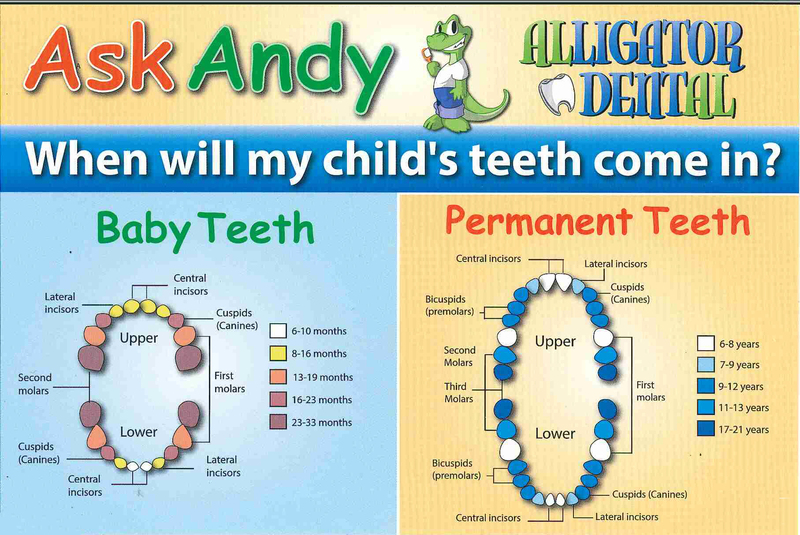 The American Dental Association (ADA) points out that people normally have 20 baby teeth and 32 permanent teeth. Enamel — This protective outer layer is the first line of defense for your tooth and delivers ideal support. Dentin — The inner layer, this material supports the enamel and serves as a messenger from the outside layer to the pulp. Pulp — Consisting of soft tissues and sensitive nerves, the pulp consists of living cells that keep the tooth thriving. Excess tooth decay can put this area at risk for infection. Root — The lower two-thirds of the tooth, this section’s purpose is to keep the tooth secure within the jaw. Many parents make the mistake of assuming that baby teeth are not important because they are temporary. In reality, these primaries are vital in setting the stage for a lifetime of proper teeth alignment and health. Neglecting baby teeth can lead to cavities and tooth decay, putting children at a higher risk for infection and future issues. In some cases, pediatric tooth extractions may be necessary. Baby teeth serve as a guide for future growth. Pulling a tooth early may not leave enough room along the jaw for teeth to fit comfortably, creating issues with alignment that can cause serious discomfort. Your wisdom teeth consist of the third set of molars to come in, typically toward the end of adolescence. While these ivories were traditionally valuable as a replacement for worn-down teeth from coarse diets throughout history, today, wisdom teeth tend to cause overcrowding and pain more than anything else. Improper eruptions of the wisdom teeth can create an ideal surface for bacteria to infiltrate, leading to concerns ranging from infection to gum disease and subsequent extractions. 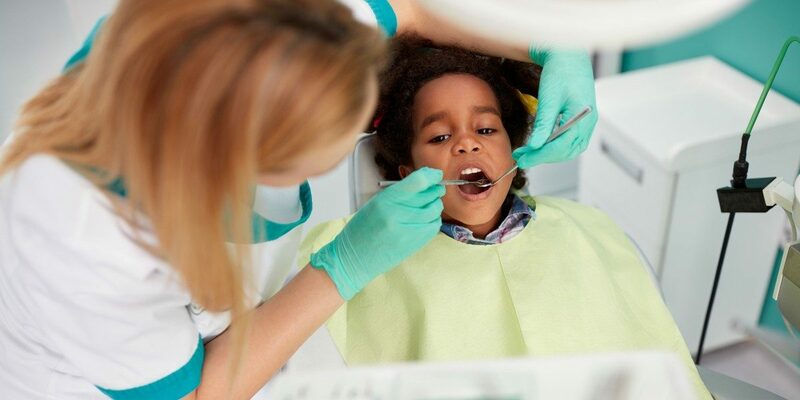 Alligator Dental is here to provide complete dental care for kids, and our team can help you to plan for all scenarios including your child’s wisdom teeth. We will rely on occasional X-rays to ensure that your child’s smile is aligned correctly and coming in comfortably. Alligator Dental is here to provide a fun time for babies, teens, and everyone in between. We’re excited to guide our patients toward a lifetime of proper oral care, and will work with you, the parents, to develop an ideal plan. Contact us today to learn more about our family dental services, and be sure to stop by for a tour!